Field stripped Glock, ready for cleaning. The Glock 17 is one of the most popular pistols in the world, and is widely carried by many law enforcement officers and civilians. 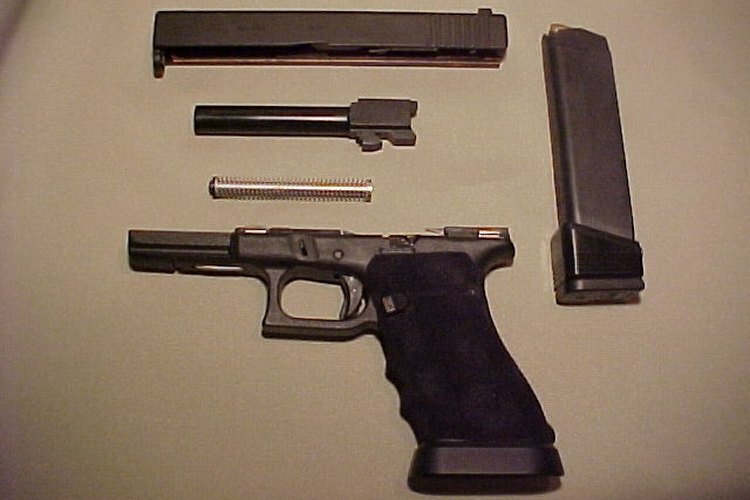 In this tutorial, I will show you how to properly field strip a Glock 17 for cleaning. The disassembly takes only a few moments with a practiced hand, and is fairly simple compared to other handguns. Firstly, remove the magazine and make sure the firearm is not loaded. Point the gun in a safe direction and do a visual inspection of the chamber. Also, do a physical inspection with your finger to make sure there is no round. Remember, safety first. With the firearm pointed in a safe direction, pull the trigger and pull the slide back a quarter inch. With your right hand holding the slide a quarter inch back, use your left hand to pull down the slide release lock on both sides. The slide should be unlocked after this. Gently release the slide with the right hand, and remove the slide from the receiver. Depress the recoil spring and remove it from the barrel. Practice makes perfect, and field stripping a Glock should be take less than 10 seconds with a practiced hand. ALWAYS make sure the firearm is unloaded, which includes a physical inspection of the chamber. ALWAYS point the weapon in a safe direction.